We then analyse the political dimension of this policy by correlating the economic outcomes with recent voting patterns. We first compute the economic impact of this policy at the level of US congressional districts. To do so, we combine the sector-specific real wage changes resulting from our general equilibrium model with information on sectoral employment shares at the congressional district level. Because sectoral employment is unevenly distributed across geographic locations, there would be distributional consequences across space as well. Figure 1 summarises the geography of the economic impact across US Congressional Districts. 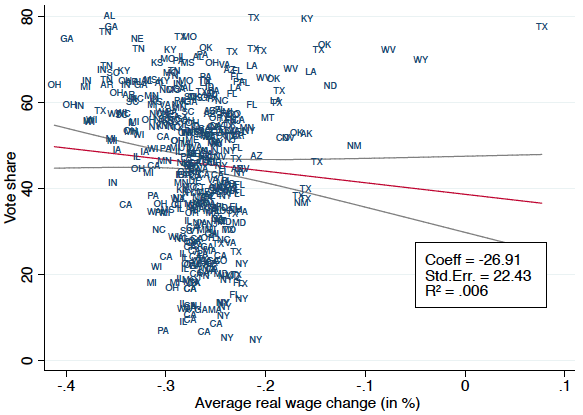 Average wage changes range from -0.41% in Ohio’s 4th district to 0.08% in Texas’ 11th district, with a cross-district standard deviation of 0.04%. This exercise underscores the difficulty of making simple heuristic judgments about who gains and losses from trade policy changes in the current global economy. The measures of import competition similar to those used in other contexts (e.g. Autor et al. 2013, and the large literature that followed) would be misleading as to which locations would stand to lose the most from NAFTA revocation, and how the distributional effects of NAFTA correlate with the Trump vote. Reaching reliable conclusions requires a model-based quantitative assessment that takes into account multiple import and export linkages and general equilibrium adjustments. To view the original paper on VoxEU’s website, click here. Copyright © 2019 Vox Media. All rights reserved.